A group show of work inspired by the artists' relationships to the landscape, featuring seven of Wisconsin’s most accomplished artists: Barry Roal Carlsen, David Lenz, Cathy Martin, John Miller, Charles Munch, Dennis Nechvatal, and Tom Uttech. Inhabited Landscapes expresses the notion that landscapes can be “inhabited” by an artist’s memories, ideas, and experiences of nature. The work selected for this show is widely diverse in style and content, and encourages viewers to think about the landscape genre in new ways. David Lenz and Cathy Martin’s paintings, for example, are breathtakingly realistic; for Lenz, the landscape is a fundamental element of his richly developed portraits, while Martin is dedicated to capturing the lyrical beauty she sees in rural Wisconsin farmland. John Miller and Charles Munch take a more abstract approach: Miller often records landscape with the sensibility of Japanese ukiyo-e prints, using blocks of color and defined outlines, while Munch takes his cue from sign painting and graphic design, creating bold compositions that explore the relationship between people, animals, and the land. Barry Roal Carlsen’s moody, dramatically lit images evoke powerful emotions and sensations; for Carlsen, the landscape is inextricably linked to human memory. Dennis Nechvatal’s intensely detailed canvases have a curiously hallucinatory impact, delineating each leaf and stone in hauntingly still tableaux. 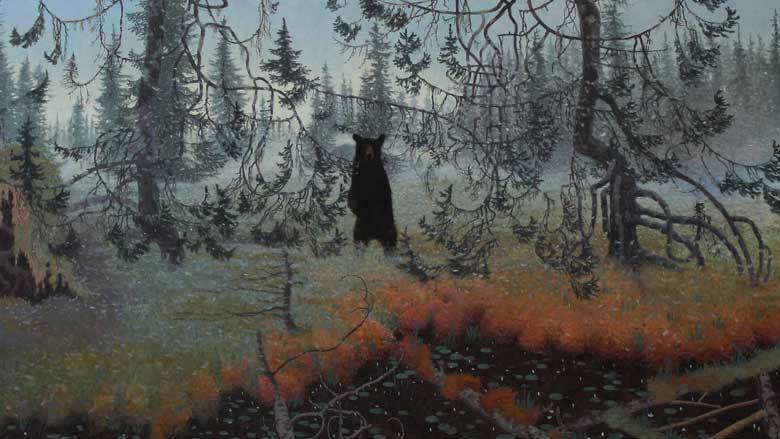 Tom Uttech’s wilderness scenes have a similarly mythic resonance, yet are filled with accurate depictions of specific plant and animal species. The work in Inhabited Landscapes goes beyond the decorative or the descriptive, asking the viewer to enter the artists’ interpretations of our place in nature. While its imagery derives from a deep knowledge of the history of landscape art, the work by each of these artists is rooted in their relationship with the natural world and reflects a personal search for meaning. Barry Roal Carlsen was born in 1957 in Omaha, Nebraska. He received a Bachelor of Fine Arts degree from the University of Nebraska at Omaha in 1980. He then moved to Madison for graduate school at the University of Wisconsin. David Lenz's paintings—whether of African American children in Milwaukee or a Sauk County dairy-farm family—explore the particular circumstances of individuals in their respective environments. His paintings, replete with breathtaking skill and warm humanity, have been described as unflinching in their detail and realism. "Painting and farming have always coexisted in my life. Born in 1945 in a suburb of St. Louis, Missouri, Charles Munch briefly studied art at the Portland (Oregon) Museum School, (1966) and at the New York Studio School of Drawing, Painting, and Sculpture (1967). He graduated, as a fine arts major, from Reed College in Portland, Oregon (Phi Beta Kappa, 1968). "My artistic goal over the past several years has been the development of an investigative process: to research and explore artistic styles and disciplines through the creative process while utilizing the history of art. This open format enables the free examination of new avenues for imagery and layers of meaning.